Before Christmas staff in Special Collections came across a book by Cardinal Nicholas Wiseman (1802-1865) and realised that the 150 anniversary of his death was approaching on the 16th February 2015. He was an Irishman from Waterford and had visited St. Patrick’s College, Maynooth when he was Cardinal and Archbishop of Westminster and had corresponded with Charles William Russell of Maynooth. He was a prolific writer and we hold in our collections 64 of his publications in the Russell Library and John Paul II Library in Maynooth University. We also have 11 books written about him including 4 biographies. Nicholas Wiseman was born in Seville on the 2nd August 1802 of Irish parents. He was the son of James Wiseman (a Waterford merchant then living in Seville) and Xaviera Strange also from Waterford. He returned to Waterford after the death of his father in 1805 with his mother and siblings. He attended school in Waterford for some years until he was sent to Ushaw College, Durham in 1810. Having decided on a religious life he was selected to attend the reopened English College in Rome. He took his degree of Doctor of Divinity in 1824 and was ordained in 1825 and although only 26 he became Rector of the English College in Rome. He was appointed curator of the Arabic manuscripts in the Vatican and professor of Oriental languages in the Roman University. 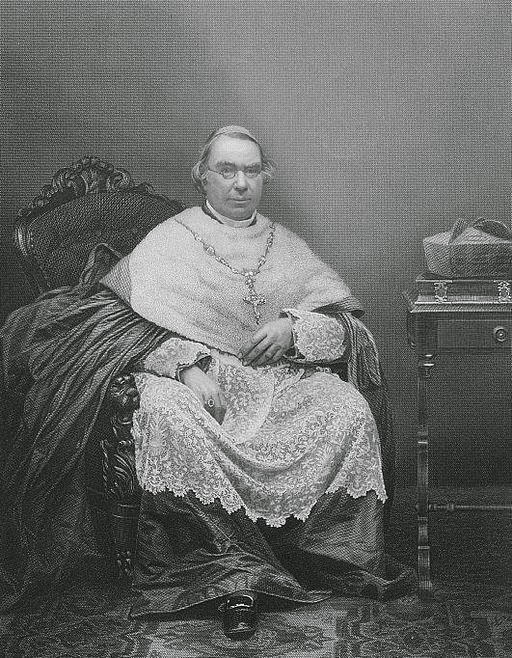 Cardinal Wiseman visited England in 1835 and was disappointed with the level of Catholic involvement in public life, despite the Catholic Emancipation Act of 1829. He embarked on a lecture tour which was very well attended and attracted some distinguished converts including Augustus Welby Northmore Pugin (1812-1852) the eminent architect who designed the library and three sides of St. Mary’s Square in St. Patrick’s College, Maynooth. In 1840 he was consecrated bishop, appointed President of Oscott College and coadjutor to Bishop Walsh. At Oscott College he became acquainted with Daniel O’Connell and in 1836 Wiseman founded the Dublin Review along with Michael Joseph Quin and Daniel O’Connell. In 1916 the name was changed to the Wiseman Review but the periodical was eventually incorporated into The Month. Dr. Charles William Russell (1812-1880) “the professors and the students, over five hundred in number, in full academic costume, were in waiting with the college grounds, and accorded to their illustrious visitor a thoroughly Irish welcome” (Cardinal Wiseman's tour of Ireland) He then said High Mass and in the afternoon he met with staff and students of the College in the new library (later renamed the Russell Library) which was still an empty hall. “In the evening his Eminence was entertained at a banquet by the president. Upwards of seventy prelates, clergy, and gentry sat down. After nightfall the college and also the town of Maynooth were handsomely illuminated in honour of the visit of the Cardinal” (ibid.). Dr. Russell corresponded with Cardinal Wiseman and some of these letters are reproduced in the Irish Monthly , also there are original letters from Cardinal Wiseman to Dr. Russell in the archives of St. Patrick’s College, Maynooth. Cardinal Wiseman’s last years were beset by ill health and an estrangement with his coadjutor bishop George Errington He died on the 16 February aged 63 and was buried in St. Mary’s Roman Catholic Cemetery in Kensal Green, London. He was reburied in 1907 in the newly opened Westminster Cathedral. His tomb was designed by Edward Welby Pugin son of A.W. N. Pugin and is the only gothic monument in an otherwise Byzantine Cathedral. The Russell and John Paul II libraries in Maynooth hold sixty four of Cardinal Wiseman’s publications.